2. Why jQuery is needed? 3. Whether jQuery HTML work for both HTML and XML documents? No, jQuery HTML only works for HTML documents not for XML Documents. 4. What are the methods used to provide effects? 5. What is the advantage of using minimized version of jQuery? Efficiency of web page increases when minimized version of jQuery is used.min.js file will be more than 50% less than the normal js file. Reduction in the file size makes the web page faster. 7. Which operating system is more compatible with jQuery? Mac, Windows and Linux are more compatible with the jQuery. 8. How can we include jQuery library in ASP.Net project? Download the jQuery library from jQuery.com and include that reference in the asp.net page. 9. Which command will give a version of jQuery? The command $.ui.version returns jQuery UI version. 10. In what scenarios jQuery can be used? 11. What is the difference between find and children methods? Find method is used to find all levels down the DOM tree but children find single level down the DOM tree. 12. What is jQuery connect? A ' jQuery connect' is a plugin used to connect or bind a function with another function. Connect is used to execute function from any other function or plugin is executed. 13. How to use connect? Connect can be used by downloading jQuery connect file from jQuery.com and then include that file in the HTML file. Use $.connect function to connect a function to another function. 14. What are the features of jQuery, has been used in web applications? jQuery uses features like Sliding, File uploading and accordian in web applications. 15. What are the browser related issues for jQuery? Browser compatibility of jQuery plugin is an issue and needs lot of time to fix it. 16. Whether we need to add jQuery file in both Master and Content page? jQuery file should be added to the Master page and can use access from the content page directly without having any reference to it. 17. What are the basic selectors in jQuery? 18. Can we call C# code behind using jQuery? Yes, we can call C# code from jQuery as it supports .net application. 19. What is the use jQuery.data method? jQuery.data methods is used to associate the data with the DOM nodes and the objects. This data method makes the jQuery code clear and concise. 20. What is the use of each function in jQuery? Each function is used to iterate each and every element of an object. It is used to loop DOM elements, arrays and the object properties. 21. What is the difference between size and length of jQuery? Size and length both returns the number of element in an object. But length is faster than the size because length is a property and size is a method. 22. Can we add more than one ‘document.ready’ function in a page? Yes, we can add more than one document.ready function in a page. But, body.onload can be added once in a page. 23. What is the use of jQuery load method? jQuery load method is a powerful AJAX method which is used to load the data from a server and assign the data into the element without loading the page. 24. Whether our own specific characters are used in place of $ in jQuery? Yes, We can use our own variable in place of $ by suing the method called no Conflict () method. 25. What are the four parameters used for jQuery Ajax method? 26. What is the use of jQuery filter? The jQuery filter is used to filter the certain values from the object list based on the criteria. Example is to filter certain products from the master list of products in a cart website. 27. Which program is useful for testing jQuery? QUnit is used to test jQuery and it is very easy and efficient. CDN is abbreviated as Content Distribution network and it is said to be a group of companies in different location with network containing copies of data files to maximize bandwidth in accessing the data. 29. What are the two types of CDNs? 30. Which sign is used as a shortcut for jQuery? Dollar ($) sign is used as a shortcut for jQuery. 31. Is jQuery is a client or server scripting? 32. What is the script build up by jQuery? 33. How can we debug jQuery? Add the debugger to the line from where we have to start debugging and then run Visual Studio in Debug mode with F5 function key. 34. What are all the ways to include jQuery in a page? 35. What is the use of jQuery.ajax method ()? 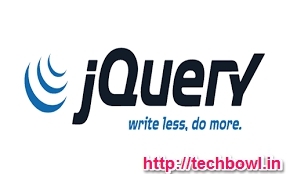 jQuery.ajax method is used for asynchronous HTTP requests. 36. Where can we download JQuery? 38. What is called chaining? Chaining is used to connect multiple events and functions in a selector. 39. What are the advantages of jQuery? 40. Whether C# code behind can be called from jQuery? Yes, we can call C# code behind from jQuery. 41. What is the use of jQuery.data() method? 42. What is the difference between onload() and document.ready()? In a page, we can have only one onload function but we can have more than one document.ready function. Document.ready function is called when DOM is loaded but onload function is called when DOM and images are loaded on the page. 43. What is the use of jQuery each function? jQuery each function is used to loop through each and every element of the target jQuery object. It is also useful for multi element DOM, looping arrays and object properties. 44. How method can be called inside code behind using jQuery? $.ajax can be called and by declaring WebMethod inside code behind using jQuery. 45. Which is the fastest selector in jQuery? ID and Element are the fastest selectors in jQuery. 46. What is the slowest selector in jQuery? Class selectors are the slowest selectors in jQuery. 47. Where jQuery code is getting executed? jQuery code is getting executed on a client browser. 48. What is the method used to define the specific character in place of $ sign? ‘NoConflict’ method is used to reference a jQuery and save it in a variable. That variable can be used instead of Sign. jQuery is a library used for developing Ajax application and it helps to write the code clean and concise. It also handles events, animation and Ajax support applications. 50. What are the types of selectors in jQuery?